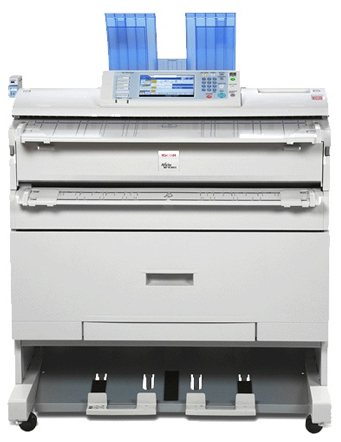 The Ricoh MP W2401 provides the dream combination: affordable wide-format document production in a compact footprint. You can securely copy, scan, distribute and archive with one surprisingly compact unit. With their top-of-the-range optional colour scanner and speed of 4.4 A1 pages per minute, these devices offer productivity improvements for the busy office. You can process a variety of paper sizes from A4 up to A0: opt for the two roll configuration or the additional 250-sheet paper cassette (up to A3).